First, off, this isn’t my recipe. It came from Michael, known variously as Arenadi on Xanga and chow on IReallyLikeFood.com. He’s been AWOL for the last several months, wrapped up working on a congressional campaign in Hawai’i. He took the time a week or two back to post this recipe on his Facebook account and it sounded so good I figured I should do my part to share it with Xangaland. As is often the case, I managed to vary the recipe a bit. It still turned out quite nicely. First thing you want to do is get your mise en place set up for dressing the tacos. This means chopping the red cabbage and mincing the red onion. Chop your cilantro roughly. Slice your avocado about 1/4″ thick and remove the skin. 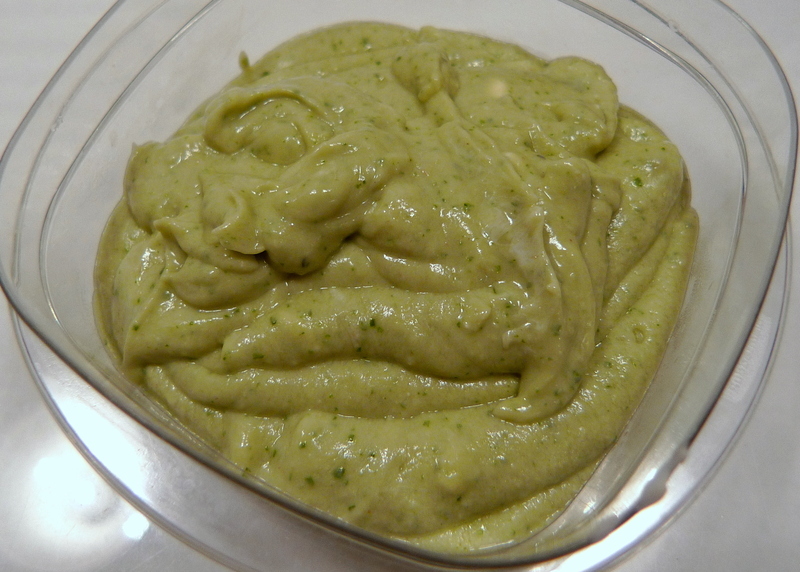 Put a handful of cilantro, a clove of garlic, about 1/4 of the avocado, a liberal dousing of Tabasco sauce, the juice of 1/4 of a Lime, a small scoop of mayonnaise, and about 2 Tbsp of cream into a blender/ food processor, and combine until you have a nice creamy sauce. Add more or less cream depending on how “loose” you want the sauce. Not being one to follow instructions carefully, I put the entire avocado into the sauce, making it very avocado-y and leaving none left for the taco itself. That’s okay, though. This wasn’t in Michael’s recipe, but it is easy to make. Chop some tomatoes, onion, chili peppers (to taste), and green pepper and pulse a few times in a blender or food processor. Add some cilantro and a few more chopped tomatoes and then season to taste. A squirt of lime juice is nice. Some salt will work, too. Note – if you like your tacos soft shell (the way I do) you can skip this step, opting instead just to warm up the tortillas in the microwave or in a skillet. Heat your oil in a skillet at about 1 to 2 inches depth to about 320 F. Using tongs or chopsticks, hold half of the tortilla into the oil and let it cook for about 30 seconds. Release it, pick up the other side (that was in the oil), and hold the side that wasn’t in the oil down into the oil to cook. Repeat until the desired crispness is achieved. Heat the oil (1 to 2 inches) in a skillet to about 340 F. Cut your fish into strips. Roll in some flour and then shake to remove excess. Then dip the fish into a beaten egg, and then roll it in the panko bread crumbs. Fry fish strips in the skillet for about 3 minutes and then turn over for another 2 minutes. Note that the timing will depend upon the thickness of the fish and could be much shorter. It is a good idea to try one piece first, remove it once browned and cut it open and see if it is cooked through. Increase or lower the heat as necessary to ensure that the fish isn’t browning on the outside before the inside is cooked the way you like it. Place red cabbage (you’ll notice I used green, which tastes fine) and red onion on the tortillas. Lay avocado slices on top of that. (Whoops – none left thanks to my mistake with the sauce!) Lay the fish on top of that. Put a nice dollop of avocado-cilantro sauce on the fish. Add some salsa (optional), a squeeze of lime, a splash of Tabasco sauce, and you are ready to serve. Serve with some black beans on the side. 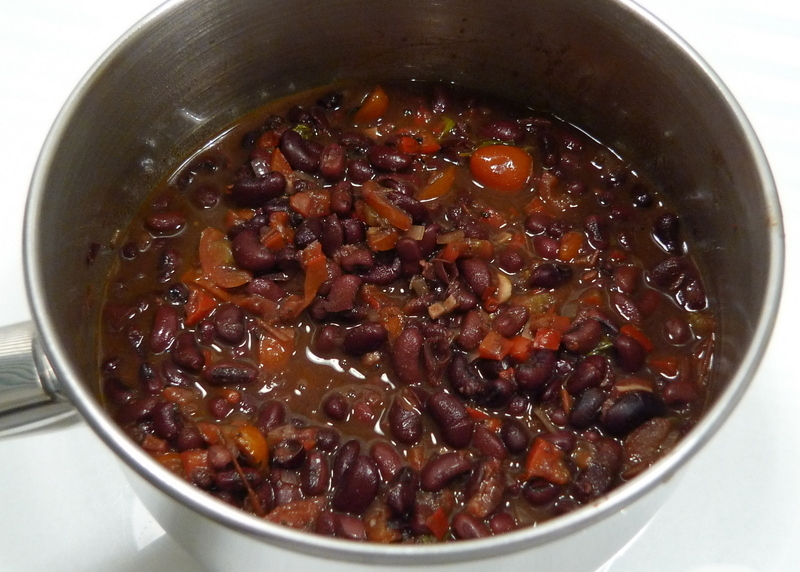 I made some homemade beans with some sofrito to flavor them – a combination of onions, red bell peppers, and various spices. Easy and very healthy. The finished product. Very tasty. Extremely tasty. That avocado sauce is amazing. Deep-frying the fish was an extra step that might be more work than I’d always want to put into it, but I think I could have just pan fried the fish and it would have turned out equally nice. Thanks to Michael for sharing this recipe with me and I hope he puts it on his Xanga site soon enough. This entry was posted in Uncategorized and tagged Arenadi, Avocado, Baja, California, Cilantro, cooking, Fish, food, Mexican, Michael, Tacos, Tortilla by christao408. Bookmark the permalink. This is something that I am familiar with. I love white corn tortillas but yellow are better with the strength to hold up this particular taco. Love it! The pictures are delicious! Looks amazing! I’m going to have to try Michael’s recipe some time soon. I’ve never had fish tacos before. yum! my mouth is watery. hahaha…I think I can do it. your salsa looks sooo good! i haven’t make salsa in a while. fish tacos..yum! It looks delicious Chris 🙂 I should try the Salsa with it, to build another dimension of flavor onto it. I’m actually going to be mass producing these next Saturday, the first time I’ll be making more than 6 at a time. I’ll be making 60 haha.Let’s keep messing with this, to see what kind of tasty modifications we can make to this recipe, eh? @arenadi – I like your suggestion. I’m not a fan of the avocado but my husband would likely think this was yummy. Aw man, I pretty much drooled when arenadi posted it up on FB and now I really wanna make fish tacos. 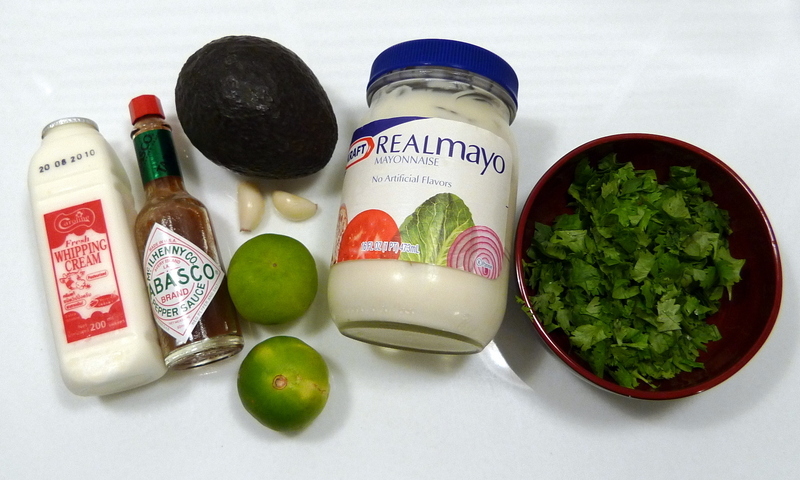 Thinking of maybe putting in a squirt of sambal instead of Tabasco… and mix in a touch of lychee juice in the salsa. Just a thought. OK, your Eggs Benedict turned out to be a hit today from brunch. So I will have to try this recipe too. i don’t like fish nor avocado, but they definitely look delicious. Thanks for posting it here as I don’t have FB. I always like how you experiment with a recipe and going on gut instinct. This looks very healthy and perfect for the hot summer nights. 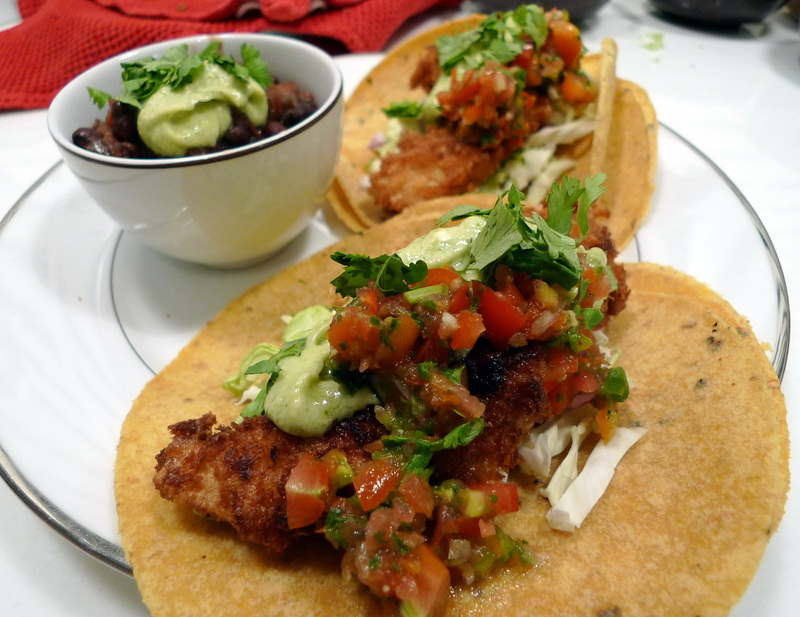 We had fish tacos for dinner last night to celebrate my husband’s birthday – always delicious!! @arenadi – Thanks again for providing the recipe. I have to say, with the work needed to deep fry the fish, it is almost better to be cooking for 60 than 6. Set up the assembly line and start frying! Reminds me of a joke about someone who went to the local parish’s fish fry during Lent and approached one of the priests, asking if he was the fish friar. Shaking his head and smiling, the man responded that he was actually the chip monk. Ha ha ha…@Roadlesstaken – @arenadi – Yes, let’s see what alternatives we can find for this recipe. There’s many ways to take it. @z_stands_for – And of course you can change it up a bit – white corn or even flour tortillas for a different taste and texture. 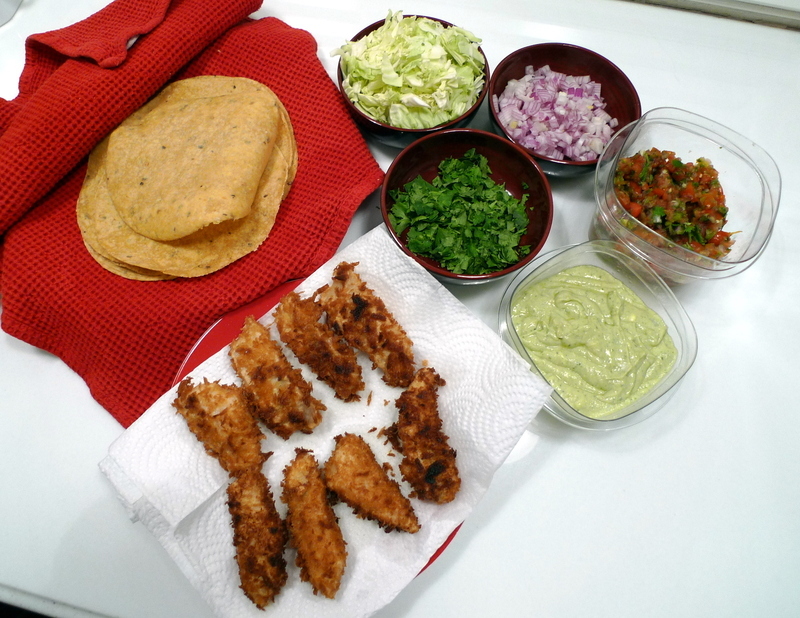 @osmundaregalis – Fish tacos were kind of a staple for me when I lived in San Diego. There’s a place called Rubio’s that serves Baja-style fish tacos that are just fantastic. Very simple and tasty. @Passionflwr86 – @murisopsis – @crucial_promises – Regarding substitutions for things you may not like: If you aren’t a fish person, I think you would find that chicken or pork – marinated first then pan-fried – would go really nicely with these flavors. As for the avocado, the sauce itself doesn’t have a super strong avocado flavor – especially if you use only 1/4 of the fruit like the recipe calls for. It is more of a “green goddess” dressing flavor. @turningreen – Now, that’s the way to celebrate a birthday! @ElusiveWords – Too bad you aren’t on there… but I understand. Yeah, I’m not sure how much I use my gut instinct versus I simply am not paying enough attention when reading the recipe! @Fatcat723 – Oh, I’m glad the eggs benedict turned out well! @kunhuo42 – Stock up and try it, Aaron. Another alternative to this is to make it into a sandwich. Use a hearty bread, something whole grain, and toast slices. With the fish, pan fry or broil a fillet instead of individual strips. Add the same ingredients to the sandwich and you’ve got a tasty lunch. 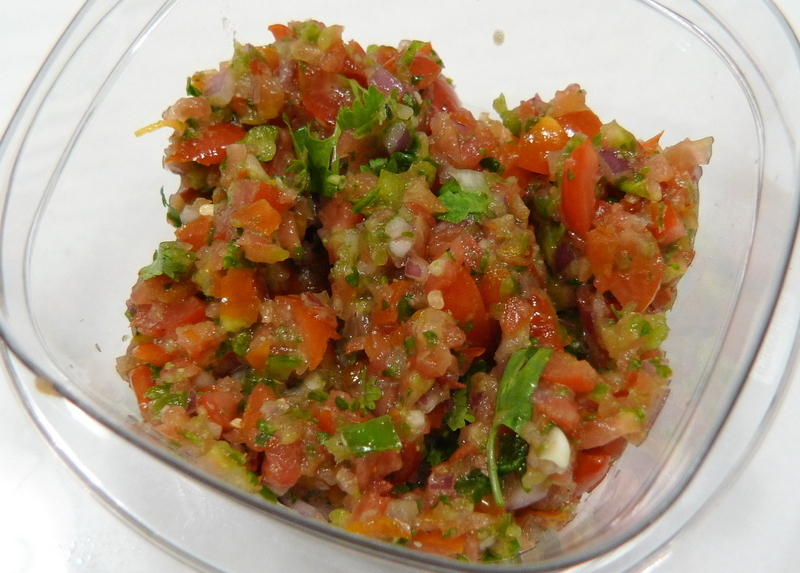 @pinksoda117 – Salsa is so easy to make, I always wonder why I don’t make it more often. @the_rocking_of_socks – @onmovement – @Chatamanda – @foggysunnymorning – Glad you enjoyed this entry! Thanks for your comments. that looks amazing..definitely making it at home when i get back !!! I make homemade flour tortillas all of the time but a change is always inviting. I have some fillets in the freezer, I may whip something up tomorrow. My favorite fish to use for tacos is tilapia. Mmmmm…I look forward to seeing Michael back on Xanga, but thanks so much for posting his recipe! @z_stands_for – I looked into making tortillas from scratch but I need masa harina, right, corn meal that has been treated with lime? Sadly, haven’t found it here in Thailand yet. @arenfro – Tilapia would be wonderful, wouldn’t it? I’ll have to keep my eyes open for it and give it a try. @iskrak – @Umnenga – Glad you enjoyed the entry. Why don’t you try it and post some pictures – then we can compare notes? Both you and Michael know how to make such amazing things. On another note, can we be facebook friends? Aw, For corn tortillas yes, you need masa harina. Couldn’t I send you a bag? Or can’t you order some?..Flour tortillas are simple from scratch, although I don’t measure because I have done it for so long, I could always fix you up a recipe for em =. And then there is the bag of mix as well,which it seems may not be on your shelves there neither..ugh. haha But let me know if I need to get a package ready to send! That looks sooo good. I could go for some fish tacos. yum yum yum. the guacamole looks velvety and the salsa looks fresh. don’t care much for the black beans but i WANT some of these. @TheCheshireGrins – Well, Michael’s the one who really knows what he’s doing. I just fake it. Tawn and I are supposed to go for a cousin’s wedding in Hawaii in March and I’m hoping to have the chance to meet Michael in person. @z_stands_for – Oh, I appreciate that, but it isn’t necessary. There are a lot of people coming to visit in the next few months and I’ll add it to the list of things for them to carry over. That list is always so long as there are just some things that are hard/near impossible to find here or are very, very expensive. One trip I brought 20 lbs of nuts back from Costco because with the exception of macadamias and cashews, nuts are expensive here. next time try using only sour cream mixed with the avocados. you’ll get more of the pure taste of the avocados. @rudyhou – Good suggestion, thanks.